AppOnboard has announced the launch of AppOnboard Studio. Read on. AppOnboard, the world’s leading app development platform for instant apps and app demos that transforms complex apps and games into lightweight native app experiences, today announced the launch of AppOnboard Studio. This new toolset allows creative designers to build an app demo without engineering resources or the knowledge of how to code. This no-code tool also enables app demos to become shareable via social platforms and SMS. “AppOnboard Studio enables anyone with an idea and creative assets to build an app demo,” said Jonathan Zweig, CEO and co-founder, AppOnboard. “Our easy to use tool-set completely eliminates all barriers of entry to app development, whether it be the cost or availability of engineering staff or the knowledge of how to code. It is truly a product that takes you from art to app”. There are three easy steps to creating an app demo with AppOnboard Studio: import your creative assets, design and build your app demo experience, and publish your app demo. With these built-in steps, designers can turn app concepts and ideas into interactive app demos in a matter of minutes. From the consumer perspective, AppOnboard app demos eliminate the need to download an app in order to experience an app’s features and content. This saves consumers time and resources by preserving precious available space on their devices. By also allowing apps to become shareable via social platforms, SMS, or elsewhere, AppOnboard enables consumers and creators alike to spread the word about their favorite app demos. AppOnboard Studio is available today to current partners who are registered for AppOnboard’s early access program. To request early access, please visit www.apponboard.com. 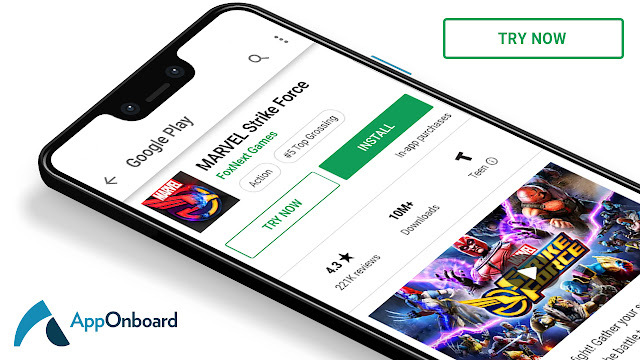 AppOnboard works with top developers, including Glu Mobile, Zynga, Big Fish Games, Kabam, FoxNext, NCSoft, Huuuge Games, Game Insight, Seriously, Mammoth Media, Wargaming, and more. For more information about AppOnboard, please visit www.apponboard.com.